The beauty of a balance bike! I had to suppress a smile as my four-year-old son, adopting that age-old child belief that bigger, more and older is better, announced that his friend’s bike was way cooler than his as it had four wheels, instead of two. Thanks to using a balance bike from the age of three, my son was now confidently riding a two-wheeled bike to and from school and, despite many positive comments from strangers, surprised at seeing such a small child cycling without stabilisers, had no idea how remarkable a feat this was. There have been hairy moments: once he had progressed from sitting on the saddle and jogging with the bike, he learnt the thrill of pushing off, swinging his legs high in the air and coasting; sometimes careering at great speed. And pulling the brake, whilst an understood concept, was not an easy task for tiny fingers. 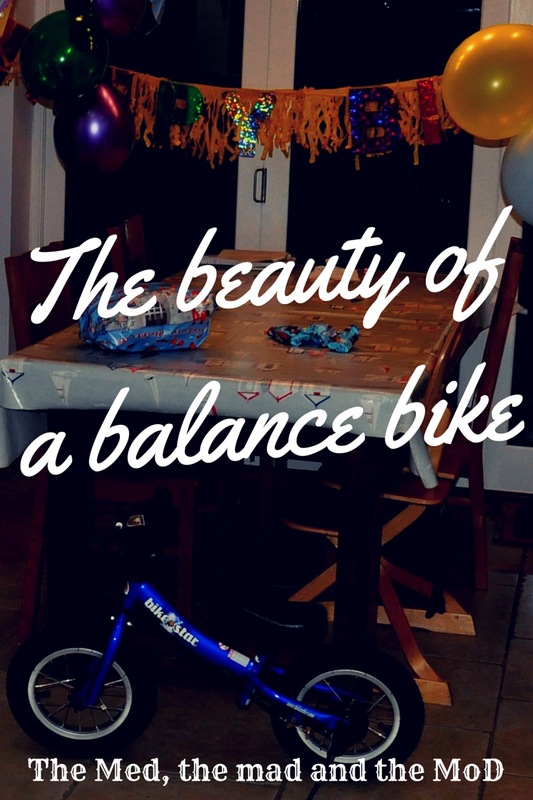 But on the whole, from the moment he pulled the birthday wrapping paper off his shiny new balance bike and got his first taste of freedom and speed, choosing a balance bike, over a bike with stabilisers, has been a decision I would make time and time again. To the uninitiated, a balance bike is a training bike, without pedals or stabilisers. I vividly remember thinking they looked a little odd the first time I saw a child sitting on one; his feet running along the ground, propelling him forward. But a few years later, having read a cycling magazine’s feature heralding their benefits, I decided to take the plunge and see if the hype was right. The strong argument for a balance bike is that stabilisers prevent children from developing a sense of balance by giving them a false sense of security: they learn to believe they can cycle as fast as they want and turn the handlebars sharply, as the stabilisers keep them upright! With a balance bike, they learn the difficult part – the balance and the steering – first and then to pedal later. And the evidence for this can be seen on many playgrounds and paths as although the fast and thoroughly-enjoyable cruising, with legs in the air, can scare the calmest parent into a swift run, it clearly demonstrates that the child has learnt to confidently balance on two wheels; with little fear! Moreover, when transition day to the big bike arrived, within half an hour of introducing my not-quite-four-year-old-son to pedals, he was confidently cycling on two wheels, instinctively knowing how to add pedalling to balance and feeling on top of the world. There was no wobbling, no frustration, no falling and -happily- no tears. And for us; there was no running behind trying to hold on to his seat and no wincing as bike and cyclist took the expected tumbles! We were completely taken aback at this fast and positive experience because it was in stark contrast to that of his older sister, who hadn’t used a balance bike and really didn’t enjoy the day, or weeks, or months after the stabilisers were unshackled. To this day, she is still a less-confident and enthusiastic cyclist than her baby brother and I attribute this completely to the balance bike experience, as we are a cycling family. If used regularly, I would recommend a balance bike to anyone who wants their child to learn to cycle the easy way – without fear – whilst whole-heartedly enjoying the whole experience: from the day they receive their balance bike, to the day they move to a big bike! Whether, like me, you are converted to the balance bike, or steeped in the traditional stabiliser route, I hope we can all agree on one thing: getting children off the sofa, away from screens and toasty car seats and into the fresh air for some exercise, is a positive experience for their health and fun! Surely this is every parents wake-up call. My time over the past few weeks has been dominated by setting up a Beavers Scout section – and my motivation is to give boys and girls the opportunity for fun and adventure – to get them off the electronics. And the words we use, as helpers, must surely be guided by the sentiment above.